Ever since his big, purple mug popped up at the end of The Avengers, we've been speculating about who will play Marvel's ultimate big bad, Thanos. And now we know. Josh Brolin has been cast as the Mad Titan. 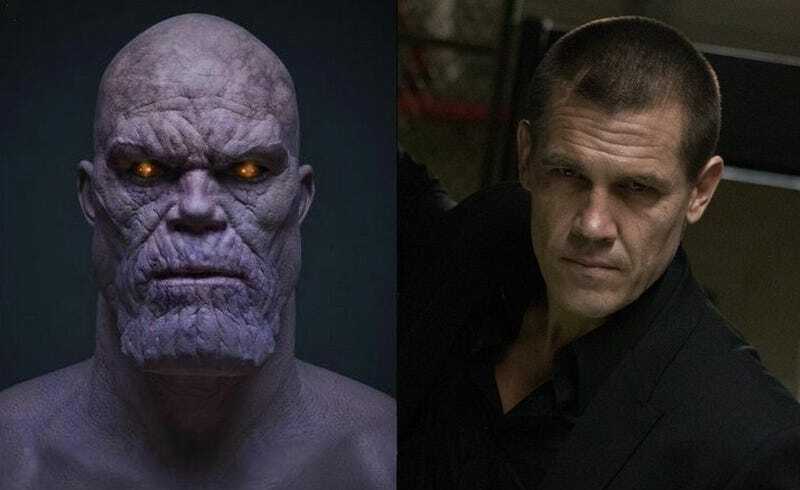 Latino Review broke the news that Brolin has been officially cast in the role of Thanos (and the trades are backing up their story). According to Marvel movie head Kevin Feige, the role had been cast for awhile, but it seems they weren't ready to announce it until just now. The Infinity Gauntlet plot line has been teased out in the Marvel movies for a very long time now, revealing one gem after the other in each film. Now we know, for certain, that Thanos will be appearing in GOTG. However, he is not the main antagonist in this film. That role is filled by Ronan the Accuser, played by Lee Pace. We can only assume that Thanos will be manipulating things from behind the shadows—but will play a much larger part than he did in the Avengers film, obviously. Plus, if you believe certain whispers, Brolin could appear in Avengers 3 as the main villain. We have to admit, we thought Thanos was going to be Benicio Del Toro. And before that, we suspected Vin Diesel would be voicing the role, but it turned out that he was cast as Guardians of the Galaxy team member Groot. But Brolin works; he's definitely got the intimidating pipes to play this villain.